Homepage. This page: Details of a gathering for owners of scooters, back in the 1960s, organised by a club in North Wales. Jackdaws - Vale of Conway Scooter Club. This leaflet, dating to 1961 and produced for the Vale of Conway Scooter Club (VCSC) also known as the Jackdaws, was found in a North Wales shop, so hadn't really travelled too far in the last 45+ years! 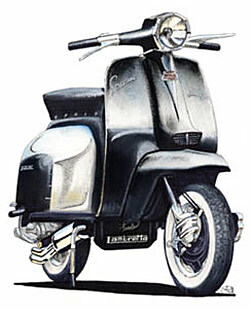 It advertised a meeting for scooter riders in June 1961. First up was an event on Friday June 9th, an overnight road trial for the nocturnal motor-scooter rider. The following day promoted a gathering at the Eirias Park Sports Arena, where there would be judging for the Scooter Queen Competition, a Concours D' Elegance, plus various other displays and stands. The long weekend of events would wrap up on the Sunday, with a Grand Parade of scooters taking to the roads of North Wales. Does anyone remember this or similar events, and have any photographs?? It must have been quite a sight (and noise), the streets full of mods and scooter enthusiasts puttering by, foxtails waving in the breeze, vast collections of chrome lamps and mirrors glistening in the sun as they rode by. Anyone wishing to enter would need to contact the VCSC secretary, who lived in Mochdre near Colwyn Bay. Perhaps this leaflet once belonged to this secretary? Return to the motoring collectables page for more one-off items that relate to transportation.